Ariados in game: 430 Who? Important notice! Pokemon Ariados is a fictional character of humans. 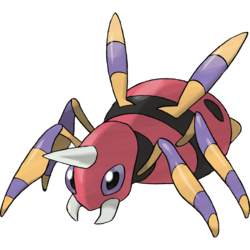 Ariados is a Pokémon that resembles a spider. It has a red body with black stripes and markings on is rear that form a face. In the center of its head in small, white horn. Additionally, it also has small purple eyes and a pair of white mandibles. 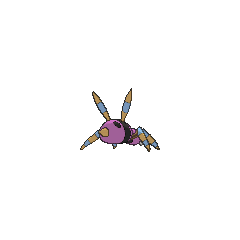 Ariados has four yellow legs with purple stripes; long, pointed growths on its back appear to be remnants of its fifth and sixth legs. Ariados's feet are tipped with tiny hooked claws that enable it to scuttle on ceilings and vertical walls. It spins a single strand of a special string endlessly out of its rear. The string can also be spun from its mouth; however, it is hard to tell which end is which. Rather than making a nest in one specific spot, it wanders in search of food after darkness falls. It will attach silk to its prey and set it free. Later, it tracks the silk to the prey and its friends. Ariados makes its nest in the depths of the forest. Ariados made its debut in Ariados, Amigos under the ownership of Tōkichi. Oakley has an Ariados in Pokémon Heroes: Latios & Latias. An Ariados appeared in All in a Day's Wurmple, under the ownership of Forrester Franklin. Harley's Ariados first appeared in The Saffron Con. Pokémon Hunter J owns an Ariados which first appeared in Mutiny in the Bounty!. 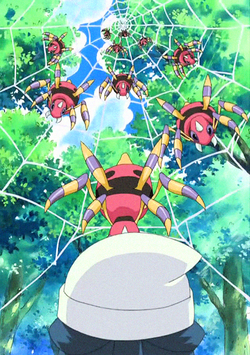 As J proceeds to steal her victims' Pokémon, she has her Ariados tie up her victims with String Shot. J's Ariados also made a short appearance in Pillars of Friendship!, where J told it to use String Shot to tie up Ash and his friends and prevent them from stopping the Legendary titans and Regigigas as well. In Following A Maiden's Voyage!, some Ariados attacked Dawn and her Piplup. Several Ariados attacked Dawn and her Piplup again in Stopped in the Name of Love!. Even more Ariados attacked Dawn and Piplup in Historical Mystery Tour!. A Shiny Ariados and many other Ariados attacked Dawn and Shinko in SS024. Multiple Ariados appeared in Diancie — Princess of the Diamond Domain. An Ariados appeared in A Slippery Encounter!. Multiple Ariados appeared in Defending the Homeland!. They are one of Florges's minions who orders them to attack Goodra's homeland in a flashback, they were used once more to attack Goodra and its friends. They reappeared in Beyond the Rainbow!, Master Class is in Session!, and Performing a Pathway to the Future!. Three of them reappeared in XY140. Four Ariados appeared in The Legend of the Ninja Hero! under the ownership of the Ninja Army. They reappeared in the next episode. Ariados were mentioned by Misty in UnBEARable when Ash, Brock, and Misty were talking about scary Pokémon in the woods. Several Ariados appeared in For Ho-Oh the Bells Toll! where they protected the Tin Tower after Team Rocket stole the crystal bells on the top floor. In One Team, Two Team, Red Team, Blue Team!, Angie used an Ariados in the first leg of the Pokémon Triathlon. Multiple Ariados also appeared in a flashback in A Slippery Encounter! and An Oasis of Hope!. An Ariados appeared in Meeting at Terminus Cave! inside the Terminus Cave. EP176 Ariados Ash's Pokédex Ariados, the Long Leg Pokémon. The evolved form of Spinarak. 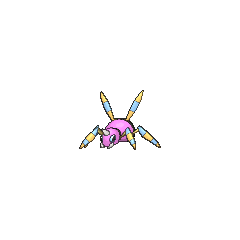 Ariados is able to spin extremely strong and sticky webs to trap its adversaries. 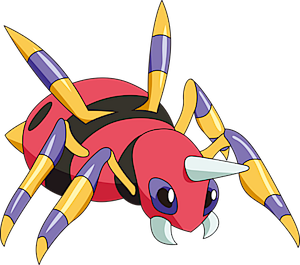 Ariados's appearance is based on the Myrmarachne formicaria spider, but with the prosoma (thorax and head area) and opisthosoma (abdominal area) reversed, fitting with its Pokédex entry.